Can Germany Reform American Labor Relations? German corporations are far more respectful of worker rights—and may have more influence on future US developments than our politicians realize. A strangely provocative role reversal has developed between two friendly rivals in the global economy. In the past, it was usually the United States that lectured other nations on how they should be more like America. This time, it is a German industrial giant that wants to make the US economy more like Germany’s. Can this happen? Maybe—if American workers agree that the German approach is better. The issue is labor relations. The German system is more democratic and far more respectful of worker rights. Instead of the relentless unionbusting and virulent anti-labor propaganda common in US industry, German labor law requires consultation and collaboration with workers in the Betriebsrat, or works council—people directly elected by the employees, blue-collar and white-collar alike. At a minimum, German workers are guaranteed a voice in corporate decision-making. The works council is what the Germans proposed for a Volkswagen plant in Chattanooga. Volkswagen did not want to export this German version of labor law to Tennessee for sentimental reasons. VW operates more than 100 car factories around the world in the German manner. The cooperative approach, the company has found, allows more flexible management and more productive assembly lines. Who would be against that? VW partnered with the UAW and put the question to a vote by its Chattanooga workers. (The dozen or so “foreign transplants” that now produce 30 percent of US car sales are all nonunion and mostly spread across the South.) The usual anti-labor forces were inflamed by the precedent that Volkswagen’s initiative might create for American workers. Republican politicians and right-wing ideologues like Grover Norquist rushed in with lots of money to demonize the project and the UAW. Senator Bob Corker, who as Chattanooga’s mayor had campaigned to attract the VW plant, warned that company officials had told him that the new line of SUV production wouldn’t come to the Tennessee plant if the union won. Corker was lying; the company refuted the claim. In the end, the reform experiment was narrowly rejected by workers, 712 to 626. It’s difficult to know exactly what led them to vote no after a majority had signed cards calling for the vote. In addition to Republican scaremongering, some workers were alarmed by the neutrality agreement VW had worked out with the union. Was the UAW selling them out? Union officials did a poor job of responding to the doubters, whose skepticism was more about the union than VW’s proposed works council. In other circumstances, that defeat would be the end of the story, or rather a variant of the same old story: “Big” Labor loses again and will get still smaller. But this time may be different because other players are involved, and they have global leverage. The potential consequences for the losers are not confined to the stagnant backwaters of American politics. Volkswagen has strong obligations to German labor, too. IG Metall, Germany’s large and powerful metalworkers union, is a hardball presence in corporate affairs. The union has been a powerful influence in VW decisions on where the company could locate overseas production. It was IG Metall, consulting closely with the UAW’s American leaders, that pushed the company to undertake the reform venture in Chattanooga. Volkswagen is likewise obliged to listen respectfully to its works council back in the home country. A works council usually doesn’t have veto power over corporate decisions, but its objections can discourage policy ideas that workers think are wrongheaded. That sets the stage for ongoing consultations. In Germany, union representatives also sit on the powerful supervisory board that makes VW’s major decisions (a practice unheard of in US boardrooms). 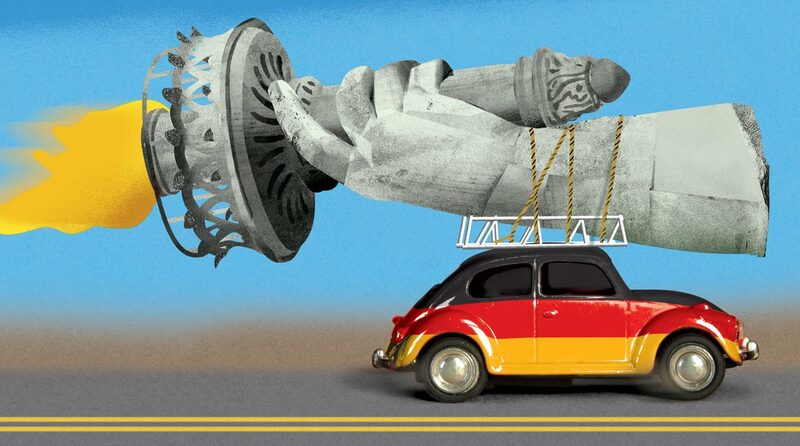 German labor struck back swiftly after the American workers rejected VW’s proposition. Two days later, Bernd Osterloh, chair of VW’s works council and a member of the company’s supervisory board, threatened to block any further investments in the American South if the workers were not able to unionize. “I can imagine fairly well,” Osterloh said, “that another VW factory in the United States, provided that one more should still be set up there, does not necessarily have to be assigned to the South again.” That might give pause to those right-wing Americans promoting union-free factories. What if the foreign investors insist upon having one? So Germany may have more influence on America’s future development than Southern politicians realize. And VW’s deal with the UAW can change the larger landscape for social reform in the global marketplace (the UAW vows to try again). If a union and works council are established at VW, then IG Metall can pressure the other German car companies—Daimler (which owns Mercedes) and BMW—to do the same at their transplants. Japanese manufacturers are a different case, but they too will feel pressured to change. For that matter, so will other US companies and unions. If workers in Tennessee can elect representatives to talk directly with management, why can’t General Electric workers in Connecticut? Or mill workers in South Carolina? Germans might say that America has not yet absorbed the social lesson. Perhaps the labor skirmish in Tennessee can become a teaching opportunity, a chance for Americans to examine other approaches, like Germany’s “social market” capitalism, and provoke a more energetic discussion of our possibilities. For now, US politics seems motionless, unimaginative and self-absorbed. Retrograde Republicans react predictably, but where is the so-called party of working people? Democrats remain silent, when they could be rallying support for the bold reform that Volkswagen and the UAW are seeking. “The United States has to think about providing that German-style relationship,” Silvia says wishfully. “If you could just get the people out of their trenches and start to interact.” He does not sound especially confident.